When young carer Bethan Owen took up karate it was merely as a means of "distraction" from looking after her mother who has epilepsy. By the age of 12 she had already earned a black belt and was coaching others. Now a sixth form student, she runs her own not-for-profit club helping fellow young carers gain confidence. "I don't know what I would have done without karate - but now it's just me being me, I love helping people," she said. Little wonder then that she was presented with a St David Award by First Minister Mark Drakeford, last month, in recognition of her work. From the age of four, Bethan, from Bodelwyddan, Denighshire, was helping care for her mother. It meant keeping a watchful eye for any sharp knives during washing up and standing outside the bathroom door while her mother was in the shower. Yet to Bethan, that was all normal. "We all lived with mum's epilepsy," she said. "Mum has had the illness as long as I can remember, which was hard as a child to see it and always be worrying about it. "Me and dad always have to be there for her, so she's not alone in case anything happens. "I had to grow up quicker than my friends... but I'm glad I did - I feel more mature and can deal with stuff." 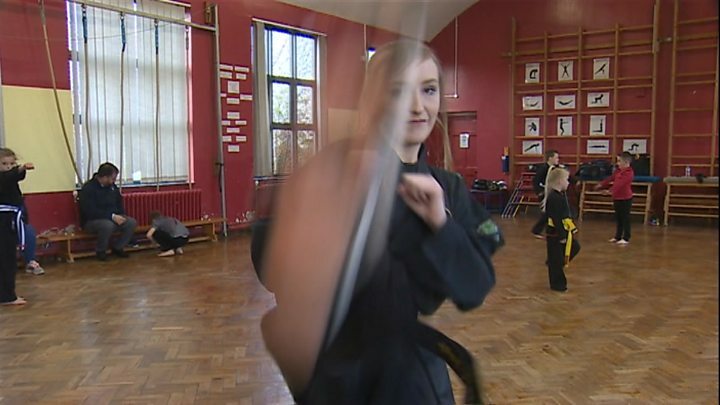 However Bethan, who studies at Ysgol Emrys ap Iwan in Abergele, admits karate has been the release that has got through the extra responsibility. She responded to a leaflet that came through the front door advertising karate lessons and was immediately hooked. "I enjoyed it because it really distracted me from what was happening at home. "It provided me with freedom and my own space where I could feel comfortable and not worry." As she moved up through the ranks, Bethan had the idea to help other young people through her own club, aged just 12. She began running classes in Rhyl and Llandudno for other carers and now has 35 members of all ages. "I opened this class to help the less fortunate and to distract them from what's going on in their background," she added. "I know what their experience feels like. I can see the worries they have. But karate is time away from that. "It's rewarding to me knowing I helped someone. It's incredible to watch the children grow in confidence and their shells open." Image caption Her father Garry says karate has "brought the family together". The karate club has become a family affair with her parents helping with classes. "Bethan has maybe had to grow up a bit quicker than most. That's been her life really from the age of four," said her mum Julie. "But she has turned the situation into an advantage and we've all benefitted." One of her young pupils, Kira, said she started because she was "afraid". She said: "I've had a lot of opportunities because of Bethan. It's made me a more brave, I feel I can stand up to people if they are bullying me."